Imogen's Typewriter. 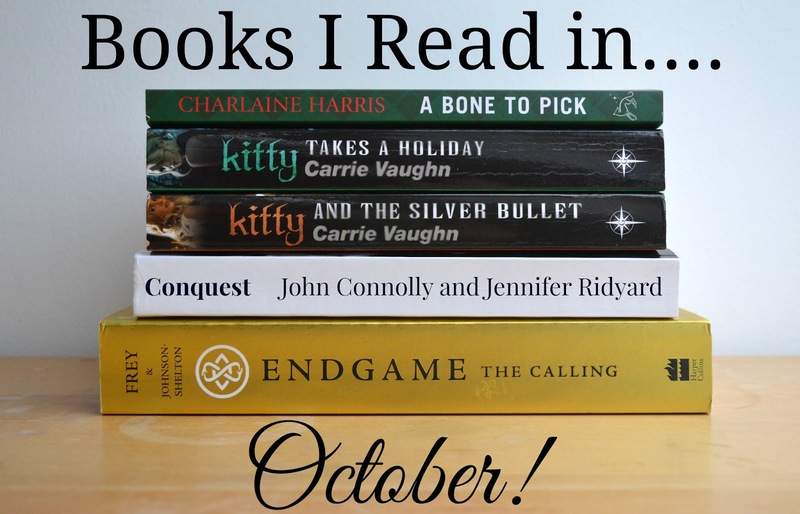 : Fiction Friday: Books I Read in October! Fiction Friday: Books I Read in October! I'm pretty pleased with my October reading! I read five books at a total of about 1700 pages and I accidentally kept with a bit of a theme. Two alien books, two werewolf books and a murder mystery. Yep. Definitely October. I read the first book of this series last month and loved it. It was a five star book and this series continues to be strong in the second book. In fact, exactly like the first book, I read this in one evening as part of my Hallowreadathon as I predicted in this post! The story continues an untold amount of time later but I'd put it at about 6-8 months after the last book ended, and Roe has just inherited a house. And a skull. The mystery in this story is just as gripping as the last although there was less immediate danger and less of the thrill that comes with danger. However, I think that Harris has done a great job of keeping it realistic and I enjoy reading about Roe's life even without the drama. That's a good sign in my book. I got the first three of these books from The Book People here so I have one more to read before I have to buy the rest at full price, but I'm fairly sure I will! Now this book was good! I've been reading this series through the year and I was browsing my book nook for something to read and despite this being at the bottom, hidden behind a second layer of books and with the weight of three layers of books on top of it, it was worth the time wiggling it out. I really like the Kitty Norville Series as a contemporary take on werewolves and magic and the supernatural. However, this book had one downside that really had me struggling when I star-rated it and that was that the first 200 pages were great. Amazing. Reminded me of what I loved about this series after the bumpy second book even without the radio host element that made me pick up this series in the first place. I liked the new werewolf element being brought back and the Thoreau references. But the last 100 pages felt more like the second book where the legal stuff was happening and I don't feel it was the author's strong suit. It's a four star book- but it was this close to being a three star. This book convinced me to continue with this series. If Kitty Takes a Holiday was a four star book that was nearly a three star book, then this is a four star book that was nearly a five star book. Without getting too much into the plot, we return to exploring the werewolf pack dynamics and radio show setting that I loved so much in the first book. The romance followed on well from the third book. All while adding some vampire politics. The writing continues to be strong, the story carried through the whole book and there was none of the kind of writing that put me off the second and third book. Don't let the size of this ARC fool you, this was only 40 pages shorter than Endgame and packed in a lot of information. Trying to explain this book simply is a challenge but I really really enjoyed it and I'm looking forward to the sequel, Empire, that I tweeted the cover of. I know, I know, never judge a book by its cover but- pretty. It's being published on the 1st of January and I'm all over that. The main character is totally loveable even though she's an alien, the romance is believable- no love at first sight in sight, and the plot is thick and way beyond what I expected for a YA book. It is a long book, and it takes some getting into but I really like the world and love that it's based in Scotland. And the second alien book of the month. This was a total flop for me and you can read my thoughts here! * I requested this book from Book Bridgr. As a fan of the book I was asked if I wanted to become a Chronicles Champion which I am and now have a very snazzy badge on my About Me page. It has not changed my opinion. Honesty as always. ** I received this book for review purposes. It has not changed my opinion and I am not obligated to talk about it. Fiction Friday: Books I Read in November! Pop in a Box: November 2014! A Year of Imogen's Typewriter. Fiction Friday: The Book People Haul!